Back in December, I wrote a couple articles of my father’s memoirs of the South Pacific during World War II. He served in the US Army Signal Corps and was with the invasion forces working their way through the Pacific islands to Japan. Several weeks later, I received an email from Paula, whose grandfather was with the US Army 196 Port Company Transportation Corps, serving in New Caledonia. She was kind enough to send along a photo of him. Charlie Boling is on the left, and his friend Hart on the right. My grandpa’s name was Charlie Boling. He once told me he was up for some leave time and took it to come home and see my mother (he hadn’t seen her since she was about two months old). When he got to San Francisco, the war was over and he didn’t go back to New Caledonia. He left his foot locker and everything over there. I wonder if someone got his foot locker and took it home. Perhaps it is sitting in someone’s attic. Paula wanted to know if anyone had any information about her grandfather. If you would happen to know him, be familiar with the outfit in which he served, or know where Paula might find further info, please post a comment below. I’ll be glad to forward the information to her. Every day, over 1200 World War II veterans die, leaving their history, and often their story, untold. Usually it is not the one we read in the history books. In my mind, most of these men and women are heroes, serving our country with bravery, dignity, and honor. 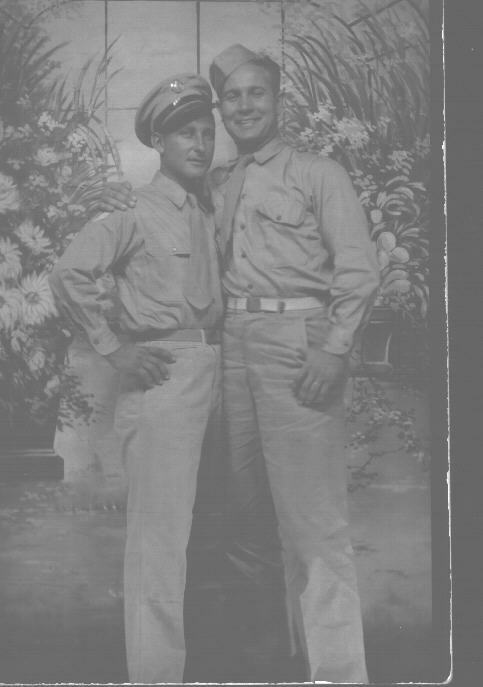 Several years ago, after hearing a story on NPR about World War II veterans, I asked my father to record his memories and experiences serving the in US Army during World War II. What he wrote was quite different than the stories we read in the history books, coming from someone who lived and served our country during that important time. That story on NPR reminded me of the urgency and importance of my fathers memoirs. Over 1200 World War II veterans die each day, many leaving their story untold. I am blessed that my father was able to write the words you read below. Many veterans, my father included, rarely talked about the war. Now onwards. We boarded another ship to sail for the invasion of Luzon. This was a quiet landing–no resistance at this point. boarded 2 1/2 ton trunks and off towards Manila. This was the amazing part, as all the way to Manila which was several hundred miles, the local people threw flowers and kisses at us. Nothing exciting happened here, except one night the driver got lost and our convoy ended-up behind the enemy lines. When we suspicioned something drastically wrong, turned around and took tail back to our line. However, nothing happened and we returned safely. Finally, arrived in Manila. Housed in a big building in town along the Jones River. Japs on the other side and holed-up in the ice house which was being blasted 24 hrs. day. Manila was a great experience. People were friendly. invited us over for dinner. Brought out all kinds of jewelry etc to sale. Stationed here several months and then our duty with McArthur was terminated and we were flown back to our co. in New Caledonia. Shortly thereafter, our company received orders to move up to Luzon. About 50 miles north of Manila and prepare for the invasion of Japan. The move was made and we had strict orders. no leaves to Manila. However, My Sgt. buddy and I decided we would like to visit friends we had made while in Manila. We didn’t have to be at work until 5 PM so we hitchhiked to Manila, visited our friends and started back which shouldn’t have been a problem. However, we got stuck on the road and late reporting for work. Called in and we were both broken of our rank. He from a sgt. and me from a pvt. 1st class. We didn’t care at this time as the war was about at the end and we were going home. Surrender was declared and the 230th moved on to Yokohama, Japan. We quartered in the YMCA. set-up msg. center downtown. By this time, war over and most of our company had sufficient points to go home. Most left, and I was getting close. In the meantime, I was appointed Tech Sgt. of my platoon. in charge of setting radio teletype stations, which I did and assigned the new arrivals to man the stations. I was given a jeep and driver at my disposal which I took advantage and visited Tokyo and surrounding areas. Really was enjoying myself at this time. However, my points-up and off I go to board the aircraft carrier “Intrepid”. Departed Japan Dec.3, 1945. Crossed the international date line on my birthday Dec. 8th. Had two consecutive birthdays. Arrived in San Francisco Dec. 15th, 1945. Troop train to Fort Knox, Ky. for discharge. However, upon arrival was informed that they had lost my records and I could have a week furlough. Off I trained home and returned to Fort Knox, Kentucky a week later for discharge. And the story of my army carrier of what my memory recollects.Many more experiences good and bad. Hope whomever has the occasion to read this in the future years won’t be too bored. Good Luck!!!! Overall, it was a good venture and only at the youth I enjoyed at that time. Dec. 7th, 1941 the Japanese attacked Pearl Harbor. I was in Zanesville, Oh on that day looking for a job on a construction project. Low and behold, I never stuck around long enough to find-out if I had been accepted. The reason, because the next day, Dec. 8th war was declared on Japan and Germany. Happen to be on my 21st birthday and looking great for military duty. I enlisted in the Signal Corp. reserves on Sept. 16th, 1942. Six months schooling for radio repair at a pay rate of $1050.00 per month. Believe me, that was big money to pay my expenses. Three months schooling was at Wheeling High School. We graduated from that point and advanced to three months training at WV Tech at Montgomery, WV. Still learning how to make and repair radios, problems etc. That was a enjoyable stay, made many friends, but now that we knew it all, we were called to active duty Feb. 26, 1942. Pay reduced to $50.00 per month. We were shipped, by troop train, to Camp Crowder, MO for six months basic training. In and out of the hospital several times for skin infections. So be it, I had to start my basic training all over again. So really, I think I had 8 months basic. Nardy Lipscher was with us up to this point. However, since he played several instruments was able to tied in with the local army band. I approached him one evening at the USO and let him know that I had received my helmet and blankets for overseas duty. I then was off again on the troop train to Camp Shanango near Youngstown, OH. This was a replacement center where ,I believe, we stayed for a couple of weeks. Was able to visit home a couple times during this period. Shortly thereafter, aboard the troop train for Pittsburg, Calif., replacement depot awaiting ship for overseas. Departed Sept. 7, 1943 for the 18 days boat ride. Arrived in Noumea, New Caledonia on Sept. 25, 1943. Off to another replacement depot and then assigned to the 230th Signal Operation Co. APO #502. Now I’m assigned a new position as a radio teletype operater. Work 8 hr. swinging shifts, co. duty one day a week and off one day a week. This was a great location, weather super, camp directly across from a beuatiful beach which I frequented often. Camp well set up with all facilities, exchange with cigarettes .50c carton. We often when into Noumea for the day as it was only a few miles away. This was my experience for the next 13 months.